The Twenty-8-Eight High Jewellery Skeleton Tourbillon is a unique piece. Special finishes has been made for ONLY WATCH: a pearly white skeleton movement and a “Black Gold” surface treatment on the flange. It is also engraved with “ONLY WATCH 2013” on the case back. This exceptional piece fully complies with the very demanding finishing norms of the DeWitt Manufacture. Entirely hand-made, the treatment and finishing-work on this piece are of a rare quality. Case, plate, bridges, wheels and even miniature screws are all angled, polished, satin-finished and treated to perfection in the patient and meticulous hands of our watchmakers. Particularly eye-catching is the alternation of polished and satin-brushed finishing on the columns of the bezel, and the setting of baguette-cut and brilliant-cut diamonds (approx. 3.7 cts). As all watches made in DeWitt Manufacture, this creation is entirely assembled, adjusted and tested by a single master watchmaker. 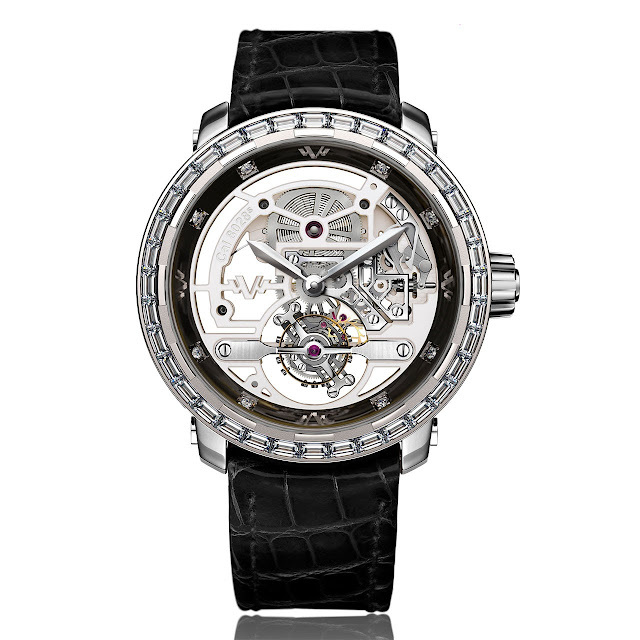 The Twenty-8-Eight High Jewellery Skeleton Tourbillon is accompanied with a luxury presentation box and a certificate of unique piece. 43 mm white gold case set with baguette-cut and brilliant-cut diamonds (approx. 3.7cts). 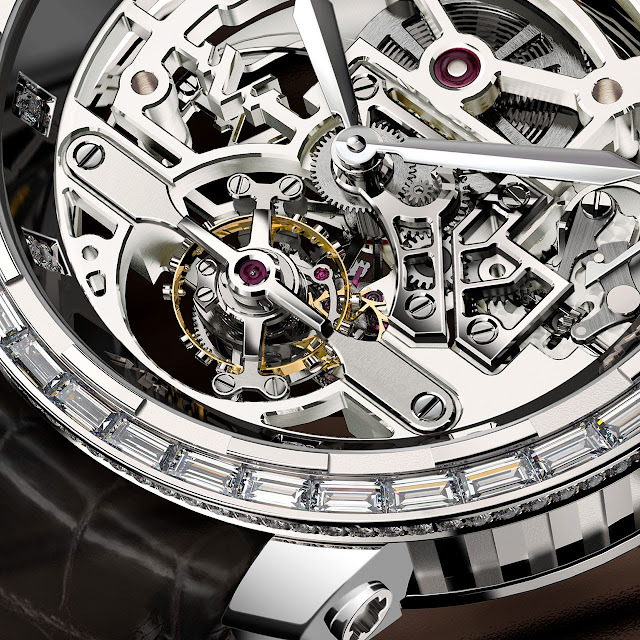 Mechanical and skeletonised manually wound movement integrating a Tourbillon manufactured by DeWitt. 18-carat white gold set with 36 baguette-cut diamonds and 104 brilliant-cut diamonds (approx. 3.7 cts), 43 mm, round case adorned with DeWitt imperial columns on the flanks, 18-carat white gold polished crown adorned with a blackened titanium ring featuring the “W” signature, sapphire crystal. Calibre DW8028s, developed and produced by DeWitt: mechanical and skeletonised manually-wound movement integrating a Tourbillon manufactured by DeWitt, hand-finished, 72-hour power reserve, 18,000 vph, variable-inertia balance, Straumann Hairspring® spiral with Phillips curve sequenced at 2.5 Hz., 44° angle escapement, 19 jewels, 185 components, 33 mm diameter. Carved-out main plate, sand-brushed nickel silver base coloured in pearly white, skeletonised “W” logo positioned at 9 o’clock. Angled, polished, and satin-finished case, plate, bridges, wheels and miniature screws. 18-carat yellow gold balance and escapement wheel. Hand-made by a single watchmaker.